In this progressive world of technology, it can be easy for your business to pay too much attention to the digital side of things and not enough on print. For certain businesses there is an extra need for printing and that’s where we come in. We can become your dedicated printing partner, always on hand to provide you with specific materials when you need them most. In this blog we will be talking about how we can work with your business, offering first class printing solutions. If your business goes through large quantities of paper at once, you may find yourself needing to make a big order at short notice. Luckily for our customers, we have the equipment, materials and hard workers here needed to ensure this isn’t a problem. Whether it be letterheads, receipts or invoice slips we can print your large order at short notice while the high quality is maintained. Here at Lintons Printers we offer a superb delivery service to all of our customers. Once we’ve printed your materials, our drivers will have your order with you in just a matter of days. We also understand how tight deadlines can be for businesses. We always go the extra mile to ensure you get your order in good time, whatever the circumstances. If someone has a specific request for us, we will try our absolute best to cater for your needs. If you run a business, you should know how vital first impressions can be. When your customers or clients view your print materials, they are likely to judge you on their appearance and quality. Your brand reflects on your business and it’s employees, so it’s important to get it right. 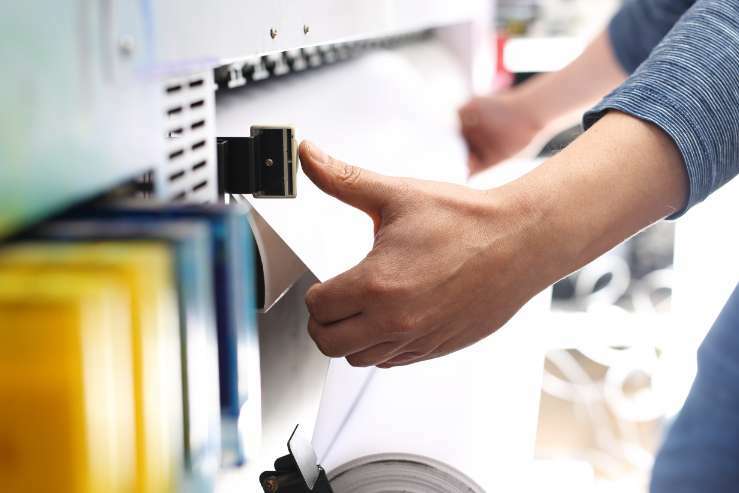 We offer printing of the highest quality to ensure your materials meet the standards expected.